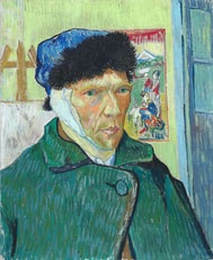 ​When kids talk about Van Gogh, its that missing ear that intrigues them. Use the gross and gruesome to reel them in with Jan Greenberg's fascinating Minute. Add this Minute to your list of articles that start with a series of questions. Art is often a reflection of a culture, and much can be learned about a time period and a society through the art produced. Have students explore the when and where of Van Gogh and Gauguin. Look at their art. Reread the Minute to glean information about the economics conditions in Europe during this time. See if students can find evidence in the paintings of what life was like. - economically, politically, socially. For a great resource, check out Google’s Arts & Culture site. Author Greenberg tells us that Van Gogh may have had epilepsy. Have students research the symptoms of epilepsy. There were no treatments in Van Gogh’s time. Are there treatments today? This is the right Minute to use to compare different types of resources. Have students look up Van Gogh and Gauguin in an encyclopedia (print or digital). Then have them search the library catalog and get a book. Have them compare the depth and breadth of available information from the two sources. Which is easier to use? Which has more in-depth information? Use this Minute to introduce students to great online art resources. If you do not have access to subscription services, no worries. Google’s Cultural Institute is a fantastic resource for exploring art and artists. Another great place for art resources is museum sites. Look at local museums online. Do they have useful websites? Go farther. Look at other museum sites - find museum sites from the closest city, from New York, from Europe.